Google’s next-gen Pixel handset is one of the most anticipated Android smartphones of this year. The California company hasn’t revealed much about its upcoming flagship, but we have already seen a handful of Google Pixel 3 concept renders. The Pixel devices are not as popular as iPhones or Samsung’s Galaxy S devices, but they have built a loyal fan base in the last couple of years. Folks at Concept Creator have come up with a new Google Pixel 3 concept that is worth checking out. The video imagines a Pixel 3 with a bezel-less design that follows the trend of other premium smartphones. The phone has only slim bezels on the front panel, and there is no notch. A thin top bezel houses the front camera, ear speaker, and other sensors. The concept has enhanced the screen-to-body ratio compared to last year’s models. It has two front-facing speakers – one at the top and another at the bottom – to enhance the audio experience. The power and volume buttons are positioned on the right side. The power button appears to have a different texture than the volume buttons. 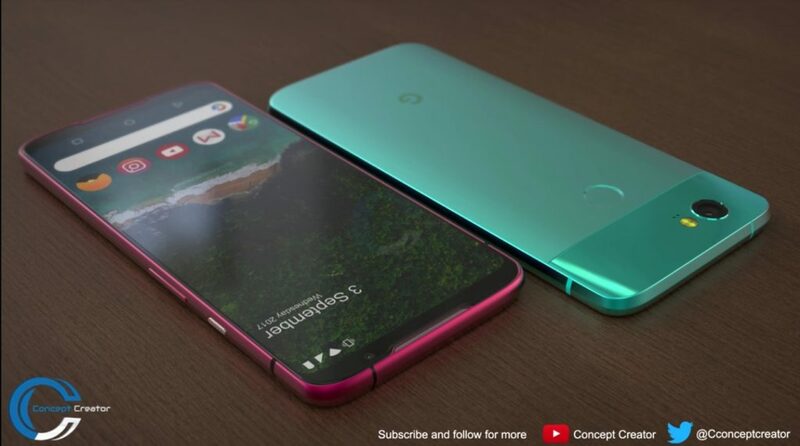 This Google Pixel 3 concept render adheres to Google’s design philosophy. It has a metal and glass design on the back panel, with the glass occupying only a small portion near the top. The device retains a single camera lens on the back. That’s quite surprising because almost every premium smartphone available today has a dual- or triple camera system. But Google has proved with the Pixel 2 that you don’t need dual cameras to take great pictures. The Pixel 2 camera uses AI and machine learning instead of a telephoto lens to blur the background in portrait photos. The Google Pixel 3 concept shows the device running Qualcomm’s Snapdragon 845 processor with a decent 6GB RAM, which should be enough to take care of even the most intensive tasks. Since Google controls both the hardware and software of Pixel phones, it can tightly integrate the two to deliver maximum performance. As BGR points out, this Google Pixel 3 concept is beautiful enough to get a lot of iPhone users to switch to Android. Though Google hasn’t confirmed anything about the Pixel 3, the Android P developer preview has revealed a lot of details about the device. The Pixel 3 would run Android P out of the box. Google has added native support for the iPhone X-like notch in Android P, which has sparked speculations that the Pixel 3 could borrow the notch from Apple’s iPhone X. The company has relocated the clock from top-right to the top-left corner to make room for the notch. Almost every major Android vendor has either adopted the notch or is planning to add it to their flagship smartphones. The Android P developer preview has also received native support for dual cameras. The original Pixel as well as the Pixel 2 had a single camera on the back, but Google could finally offer a dual camera system on the Pixel 3. The iPhone X, Huawei P20 Pro and Samsung Galaxy S9 Plus have raised the bar in smartphone photography. Google will at least have to keep up with them. The Pixel 3 is also rumored to have an iris scanner or facial recognition technology to take on Apple’s Face ID. References to Google Pixel 3 were recently spotted in the Android Open Source Project (AOSP). However, it didn’t reveal anything other than the phone’s name. The phone is expected to come with an IP68 rating for water- and dust-resistance. It would launch without the 3.5mm headphone jack. Chinese blog Qooah claims that Google will also launch a cheaper Pixel 3 later this year in select markets such as India. The search engine giant is developing the affordable Pixel 3 under the codename “Desire.” By acquiring part of HTC’s smartphone business, Google has signalled that it is serious about smartphones. According to the Economic Times, the cheaper Pixel 3 would lack many of the premium specs of the high-end Pixel 3 and Pixel 3 XL. It would launch in July or August, while the premium Pixel 3 and Pixel 3 XL would be unveiled in October. We expect to see more leaks and rumors related to Google’s upcoming devices in the coming months.